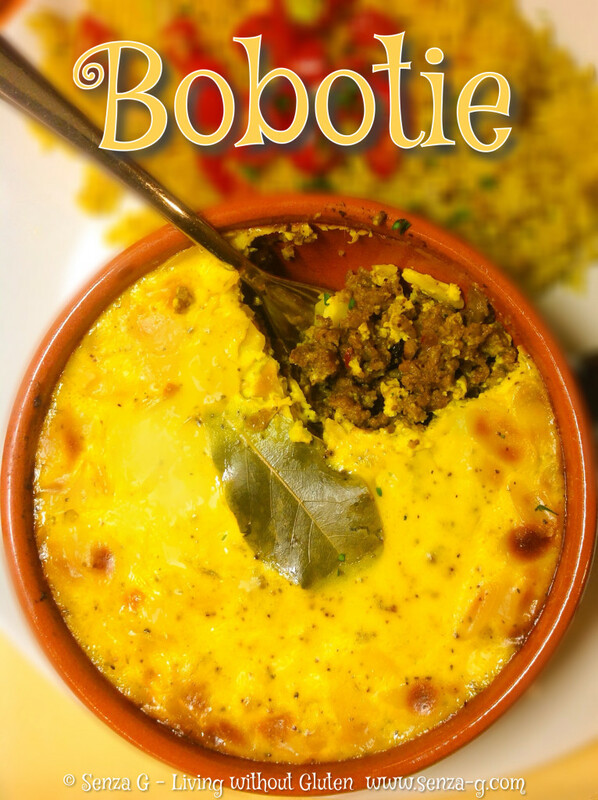 Bobotie, pronounced ba-boor-tea, is a national South African dish – it is a spicy and sweet minced meat mix, topped with flaked almonds, followed by a milk and egg custard topping. This is usually served with yellow rice and fresh tomato salsa. I made mine in individual dishes, but you can use a large dish and then cut it into portions. In a small bowl, mix the gluten free breadcrumbs together with the milk, and 3 Tbsp of milk and set aside. In a large pan, sauté the onions until edges until they start caramelizing, add the garlic and cook until fragrant. Add the minced meat, together with the bay leaf and stir well. Add also the lemon juice, curry, turmeric, chilli powder, stock powder, salt, pepper and combine well. Cover the pan and leave to cook on very low heat for 10 minutes. Add the gluten free breadcrumb/milk mix and combine with the meat. Stir in the raisins, apricots and chutney and cook for another ten minutes. Remove from the heat and put aside. Beat an egg in a small bowl with 2 Tbsp milk and pour over meat mixture, stirring it in quickly. Pour the meat mixture into an oven proof dish and spread it evenly. Sprinkle the toasted flaked almonds over the top. In a small bowl, beat the other two eggs with ½ cup milk, add the turmeric, season and pour over the meat mix and almonds. Place a few bay leaves on top and then put the dish/s in the oven. Bake for approximately half an hour or until the egg custard is set.